Mr.Moo, one of my very good friend wanted to held a birthday dinner and asked my opinion for a venue. Fitou Brasserie at The Waterfront, Desa Park City immediately came to my mind as I had previously went there with the girlfriend for some drinks and the atmosphere there is extremely good to chill out. The initial plan was to have dinner and chill out later - plan failed anyhow, lol. World Cup was on, and it was extremely crowded. 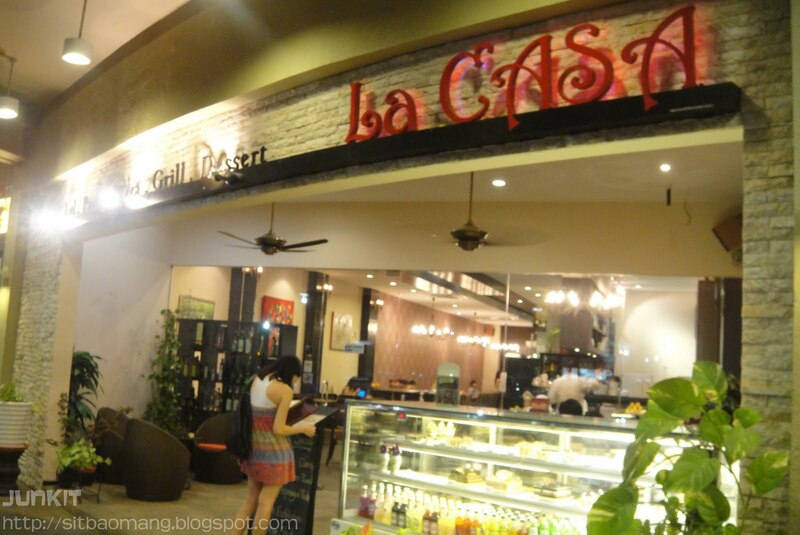 Anyway, I picked La Casa for the dinner venue; which is located just a few stores away from Fitou Brasserie mainly because I have heard and read some good reviews about the food there. 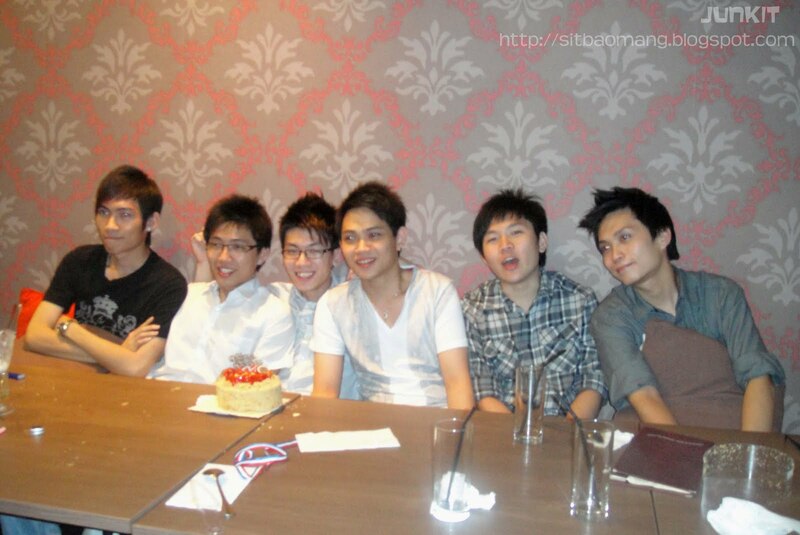 Also, the dining place is much more suitable for the 10+ pax of us as it is not that crowded. 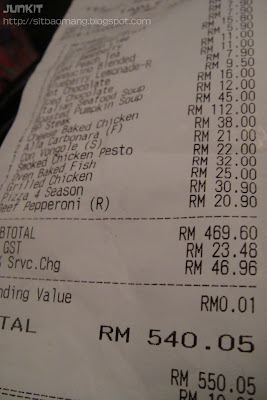 The girlfriend and I shared a Pizza Pepperoni (RM20.90 - Small (9"), RM30.90 - Large (12")) as we were headed from elsewhere and was still full. Thin crusted and very rich melted cheese on top on the first glance made my day honestly. 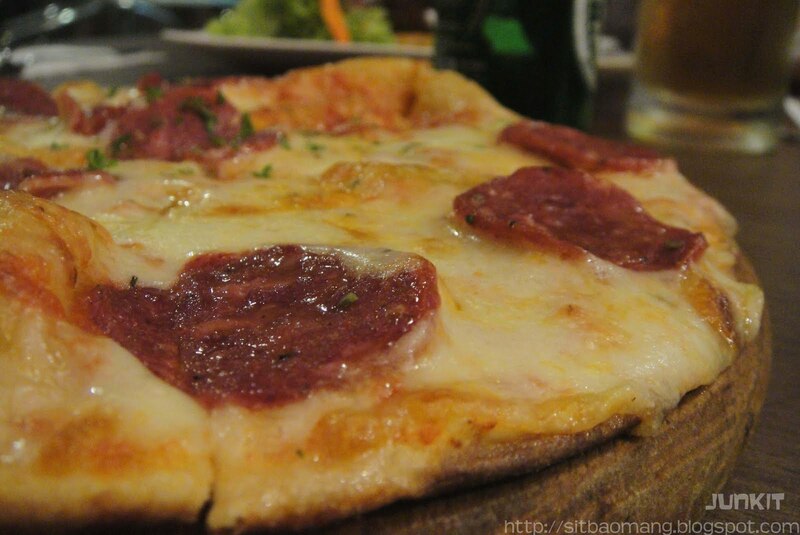 The pepperonis are also very good with very chewy and beefy flavors topped with parsley. My other friends shared a Pizza Quattro Stagioni (RM30.90 - only Large(12")). Apparently, the pizza is named so because it has four different toppings placed on each quarter of the pizza. I tasted a piece from the quarter where it has some black olive and cheese; not bad! Taken from the menu, the type of toppings you would find is massive: tuna, black olive, onions, turkey ham, pineapple, white button mushrooms, tomatoes, pepperoni and mozzarella cheese. Phew. 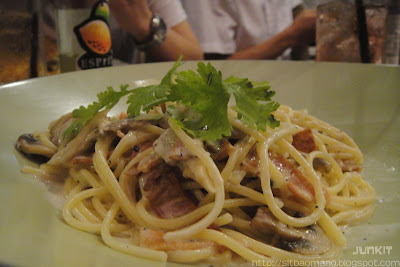 Spaghetti alla Carbonara (RM19). I noticed that the spaghetti is creamy enough yet not too over powering and has bacon and mushroom bits in it. My friend gave this dish a thumbs up. 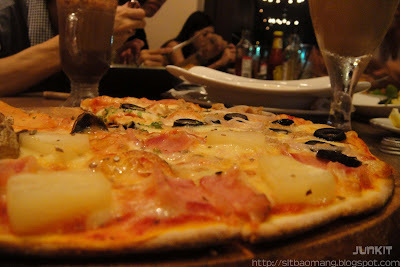 Lol, you couldn't really go wrong with pizzas and pasta in an Italian restaurant in my opinion. 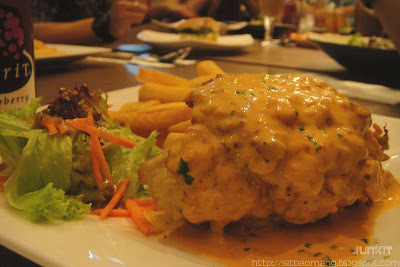 Cheese Baked Chicken (RM28). One word describes this dish: CHEESY. The whole chicken breast is coated with cheese and oven-baked. Extremely recommended for cheese lovers. Oven Baked Fish (RM32). Looks extremely healthy to me. According to the menu, the butterfish fillet is pan seared and oven baked. That explains the firm flesh yet crispy skin that I saw on my friend's plate. 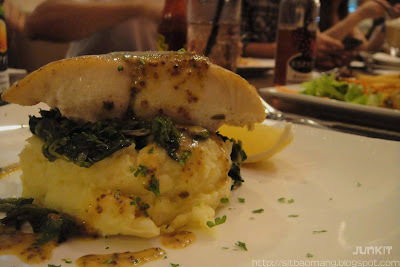 The fish also comes with some mashed potato and saute spinach. Black Pepper Steak (RM45). The birthday boy ordered the grilled tenderloin. 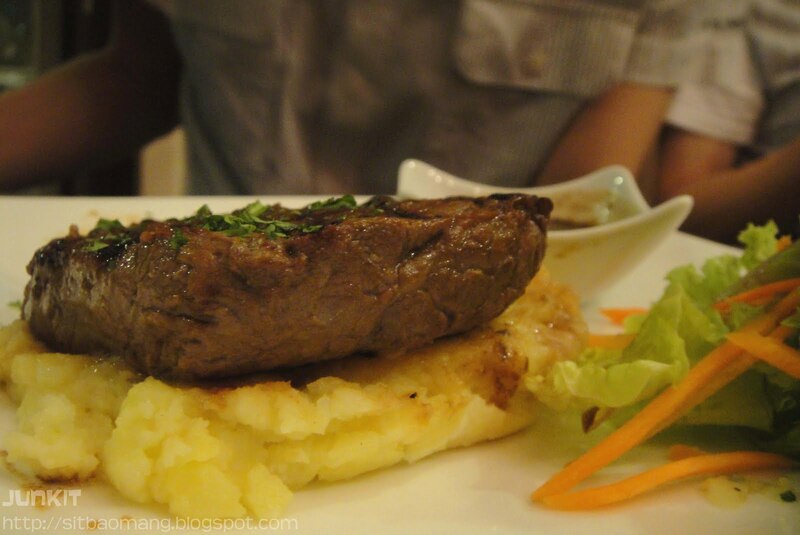 I liked how their practice of to include the separate black pepper sauce to not spoil the natural taste of the beef. No offense, but in my humblest opinion, I still felt that the best place to get steaks are from steakhouses that specializes (which explains why I never ordered any steak if I'm not in a steakhouse; mainly because I don't trust. I take my steak very seriously, lol). 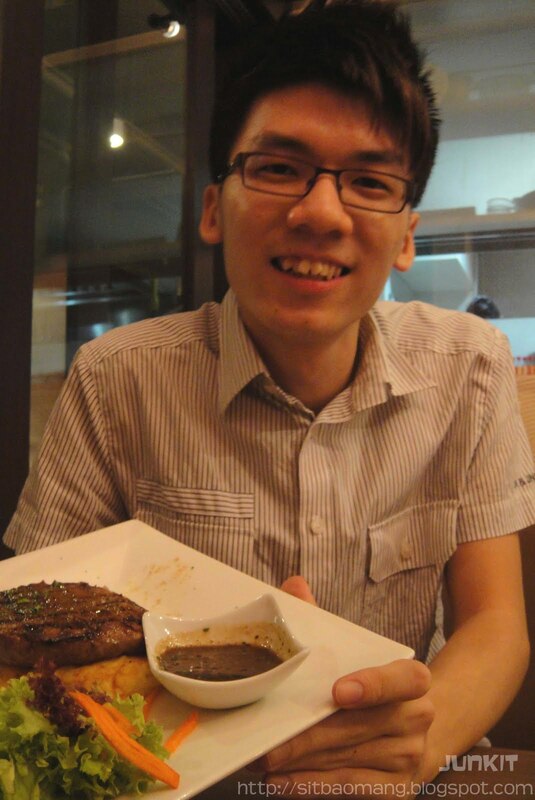 Nevertheless, the birthday boy gave this a thumbs up and I could see he enjoyed his every bite of the steak. Mr. Moo and his err.. moo carcass. Also noted that La Casa offers quite a range of cakes, but unfortunately was too full to have desert that day. 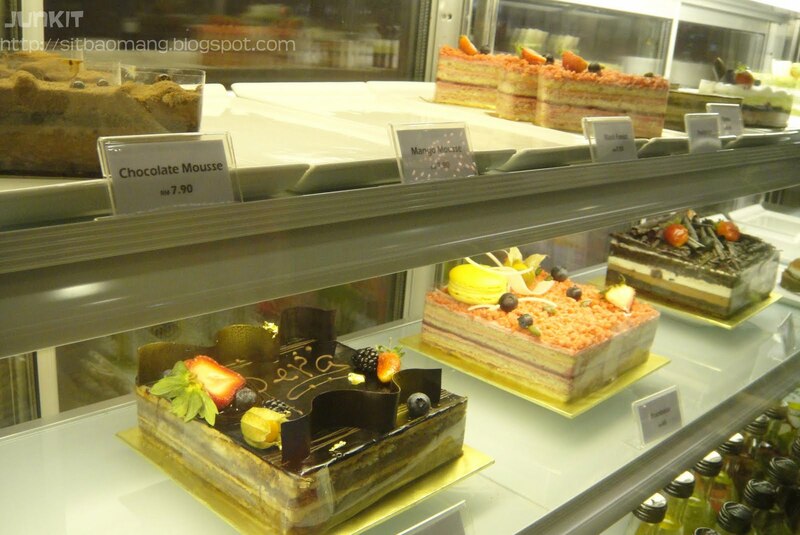 The price of a slice starts from RM7.90; pretty affordable. La Casa's shop front area. 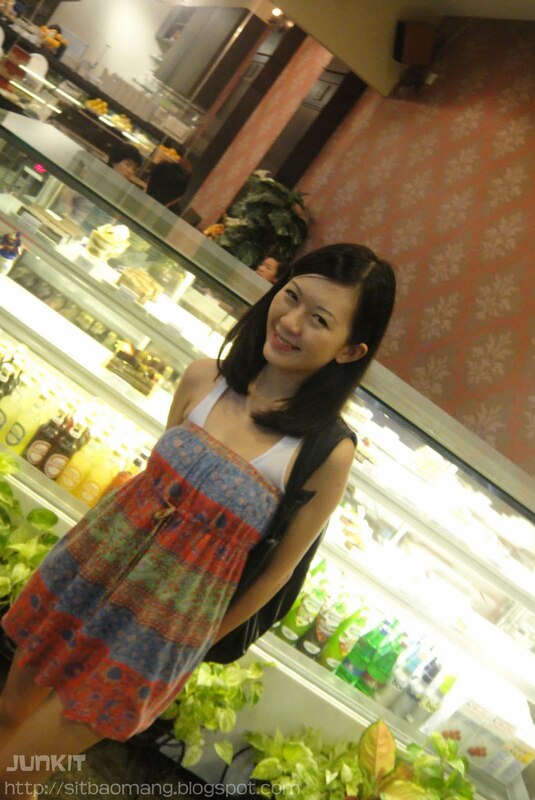 The alfresco dining area is also quite cozy with comfy semi lean chairs. The Legendary Four Aces (Sei Dai Choi Ji / 四大才子). 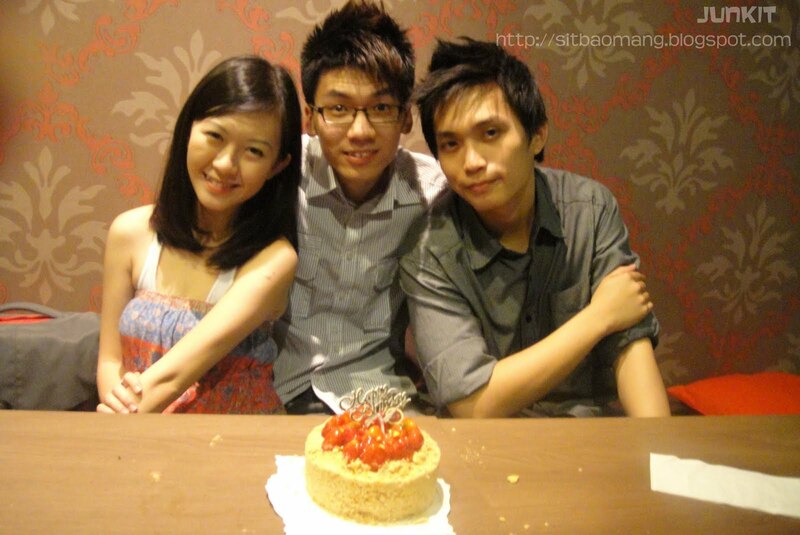 Lovebirds - Win Hou and Su Yee with the birthday boy. 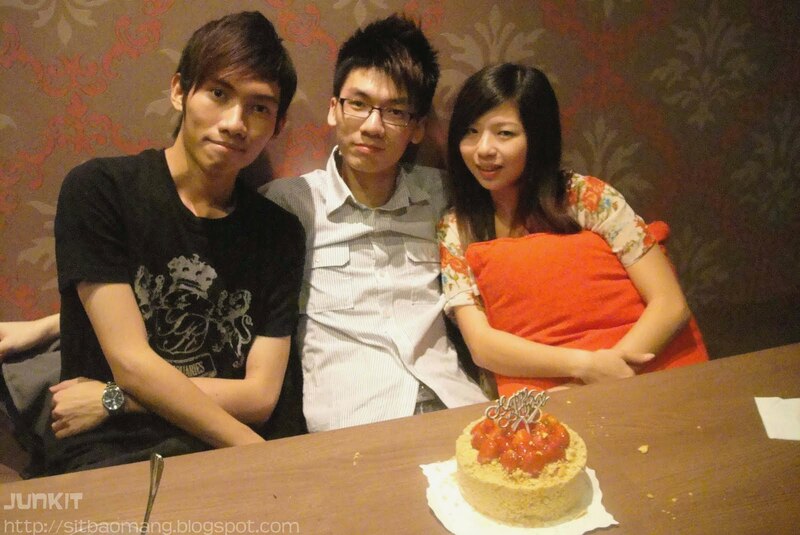 Me and the girlfriend with the birthday boy. 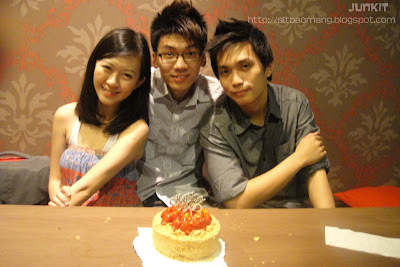 I don't know why are we both holding our own other hand, lol. The total bill for the 10+ pax of us. Ouch. Last but not least, a little too late but, Happy Birthday Mr.Moo! 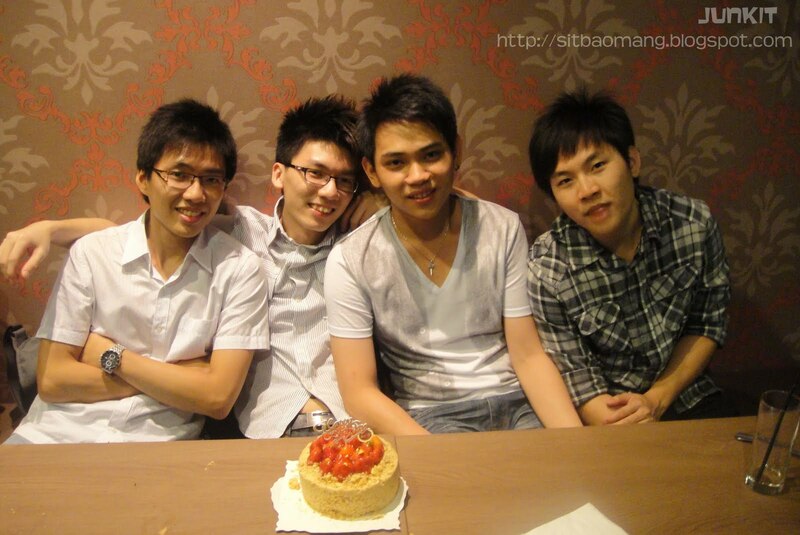 Hope you enjoyed the dinner and the group accompaniment. 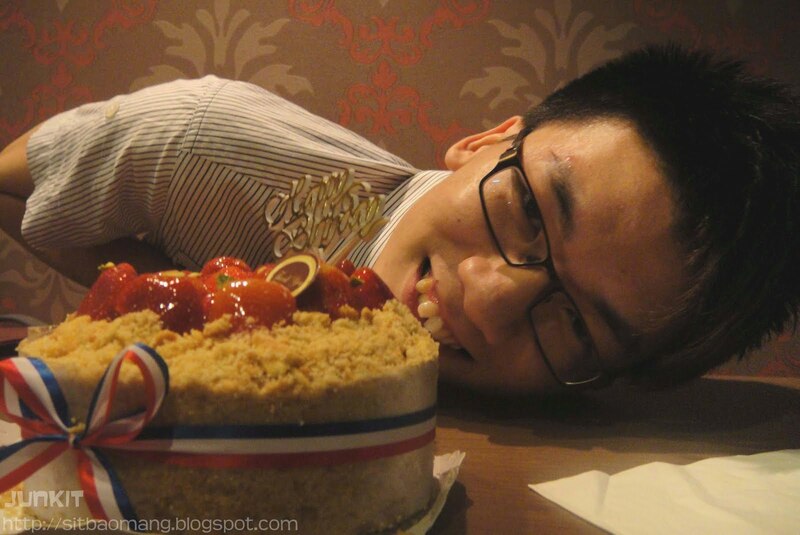 All the food looks so yummy!Happy birthday Mr.Moo! Haha it's not bad seriously. The pizza alone is worth a trip to get to there!